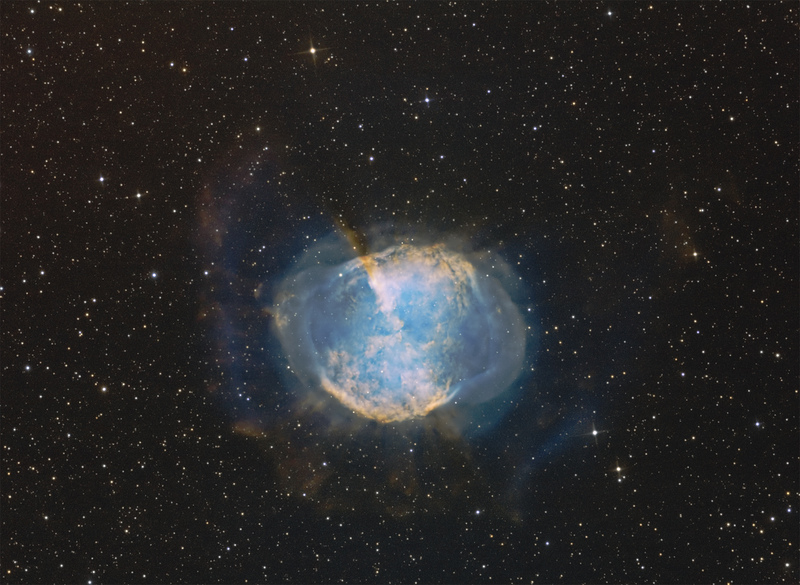 M27, known as the Dumbbell Nebula in Vulpecula, is an approximately 8′ x 5′ planetary nebula that is estimated to be 400 pc (1320 light years) distant. It has an outer halo extending ~15′ with radial rays connecting it to the main nebula (see my image).The central star is classified as O7 and is a source of X-Rays with a surface temperature of 100,000 K. This outer halo is an [NII] emitting shell that is expanding at 35 km/s and interacting with the interstellar medium. Just inside the [NII] expanding shell is an [OIII} shell expanding at 31 km/s. There are strong emissions of [OIII] and He II in the core. 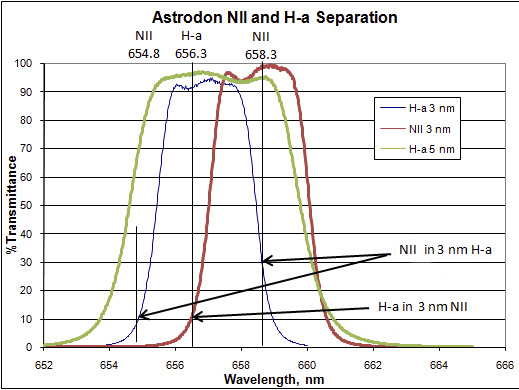 Astrophotographers may not be aware that H-a and [NII] are actually combined in their data taken with most commercially available H-a narrowband filters having FWHM >4. In fact, most research articles will refer to such data as H-a + [NII], indicating that the data contain emissions from both elements (the [ ] denotes a forbidden transition). These data were taken on Ken Crawford’s 20" RCOS RC telescope at his observatory in Camino, California (2400′) using an SBIG STL11000 camera (Kodak KAF11000XM Interline CCD with 9 mic. pixels) operated at -20 deg. C. The plate scale is 0.44"/pixel and the full field is 29.4′ x 19.6′. The images were cropped. The moon was up, and the measured seeing was an incredible 1.3-1.5". Four 15 minute unbinned exposures of each 3 nm narrowband and the 5 nm H-a were taken, along with darks, biases and flats automatically using CCDWare’s CCDAutoPilot4. Calibrations and preliminary processing were performed in CCDWare’s CCDStack and final processing in Adobe Photoshop CS3. 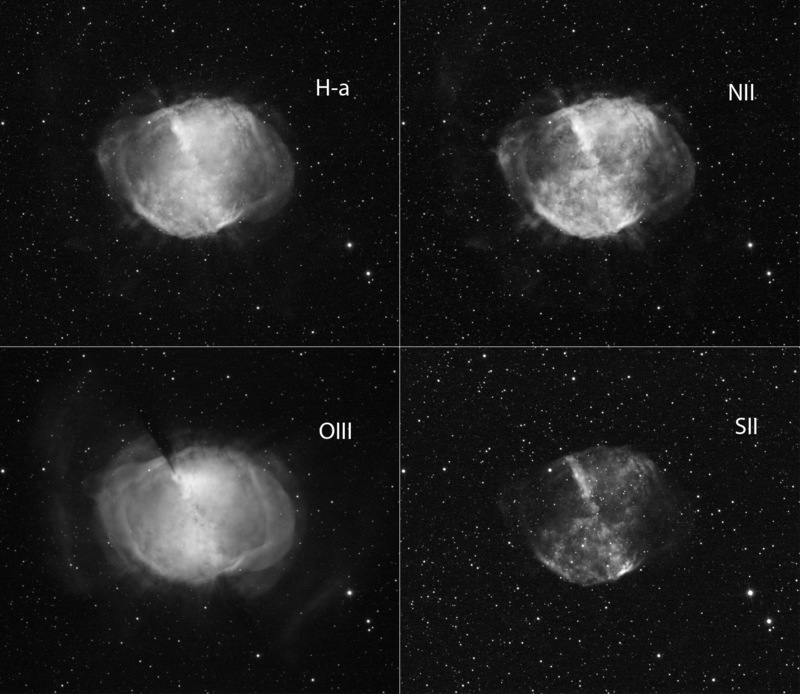 This 4-panel image shows how different M27 appears at the different emission lines. The OIII image appears as the end of an open cylinder, and there appears to be a V-shaped gap in the upper edge that corresponds to the bright axial "bar" shown in the other emissions. The SII image shows lobes in a plane tilted up about 15 deg to the left. but shows little of the outer halo present at the other emission wavelengths. What is particularly surprising is the lack of core detail in the H-a image and its presence in the NII image. Most images of M27, whether LRGB or narrowband, show the wispy clouds with sharp edges, as shown in the [NII] toward the lower left of the core. These are much less distinct in the H-a image. It could therefore be concluded that this structure is indeed coming mostly from [NII,] but most H-a filters are sufficiently wide and pick up both emissions. Thus, [NII] helps to structure what is normally considered H-a. This can be seen in the high-resolution spectral scans of the 3 and 5 nm Astrodon filters used in this study, as shown below. The 3 nm [NII] spectrum (red) overlaps the H-a emission at 656.3 nm at about 10% transmittance, so this [NII] filter passes little H-a light. The 3 nm H-a emssion (blue) transmits 30% of the [NII] emission at 658.3 nm. Of course this all depends upon the relative strengths of the emission lines, but it can be readily concluded that the wispy detail in this region of the H-a image may be arising primarily from the [NII] accepted by this 3 nm H-a filter. If correct, the H-a signal is then lacking in sharp detail in this region. Detailed features observed in H-a/RGB images in this region of the core are likely coming from NII. 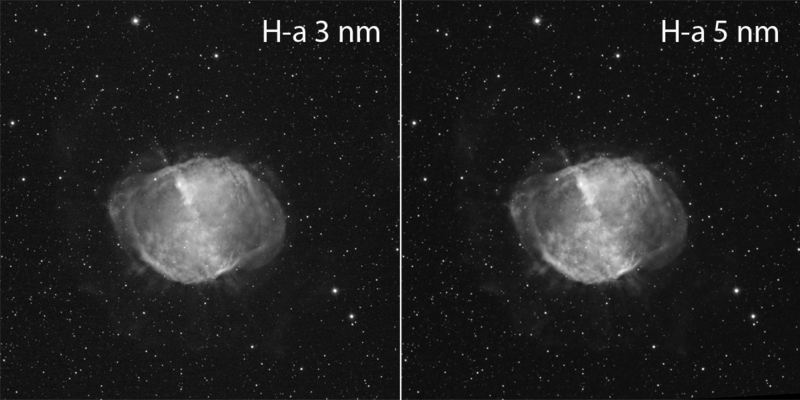 This can be seen in a side-by-side comparison of Astrodon 3 and 5 nm FWHM narrowband images om M27, shown below. There appears to be more detail in the 5 nm image, consistent with more detail coming in from [NII] into the 5 nm H-a filter. The spectral scan above shows that the 5 nm filter fully includes the H-a and 658.3 nm NII emissions. However, it is pointed out that [NII] is generally plentiful in planetary nebulae (PNe), such as the Dumbbell (M27), Ring (M57) and Helix. Furthermore, it takes a very hot star to produce these forbidden transitions. Therefore, it would be interesting to make the same comparison with an emission nebula. Melotte 15 within the Heart Nebula (IC 1805) was selected for this purpose. A side-by-side comparison of the 3 and 5 nm FWHM H-a filters is shown below (2.5 hrs of 15 minute exposures each). The results are similar perhaps signifying a low NII component within this emission nebula, and hence, no loss of overall signal or detail in the 3nm image. One of the goals of using narrower narrowband filters is to limit the background continuum, which is especially important in light polluted localities and when the moon is up. Narrowband filters extend the time that astrophotographers can utilize their equipment, even with the moon up. The use of 3 nm FWHM OIII and SII filters accomplishes that objective. That is especially true for OIII which is the wavelength region of maximum reflected moonlight. 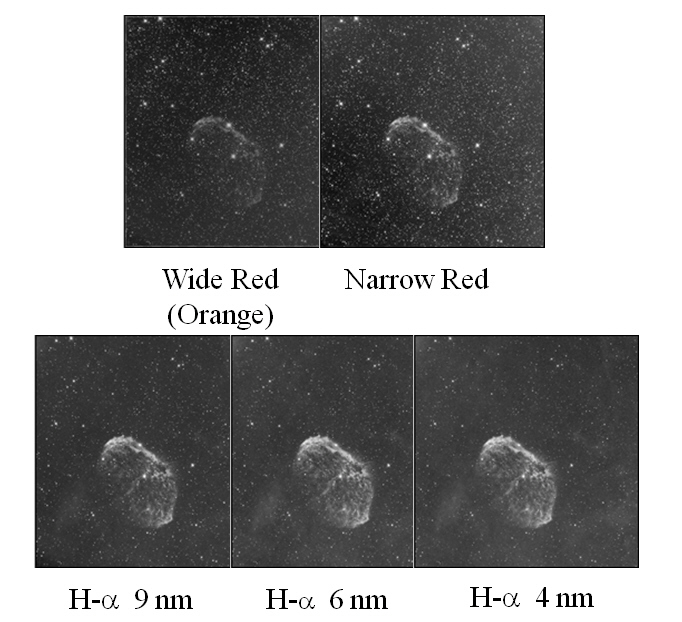 Narrower filters improve contrast, as can be seen in this progression of images from broadband orange and red filters to progressively narrower H-a filters of the Crescent Nebula in Cyguns, NGC 6888. However, as discussed above, selection of an H-a filter is more complicated. A 3 nm H-a filter will decrease the effects of light pollution and moonlight. The background signal is linearly correlated with the FWHM of the filter. But, for certain objects enriched in NII, such as PNe and Wolf-Rayet stars (e.g. Crescent, Thor’s Helmet), there may be a loss of signal in comparison to wider filters due to the elimination of [NII] from the H-a + [NII] signal. Thus, it becomes a compromise between this possible signal loss and the minimization of extraneous light sources when selecting between a 3 nm or wider H-a filter. I would like to thank Ken Crawford for the use of his equipment during this study.